With US states legalising weed for medical use and Canada planning to do the same thing, the weed industry in these countries will soon change. Along with legalisation comes the loss of the black market and lots of easy to make ready cash. Maybe it is time to change career. You should seriously consider a career growing weed. This article is all about how you can you get rich growing weed legally. 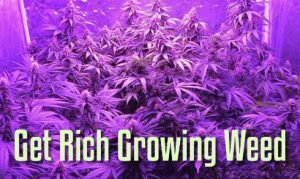 Now that you can publicise your weed operation here are some things to consider to help you get rich growing weed. Many weed growers may have been doing it long before it became legal so will have to change their ways. No longer will the regular black market supply of customers exist. And, growing weed to supply the recreational and illegal black market is not the same as running a professional business. You may know a lot about growing your weed, but how much do you know about the regulations? What about business financials to start professional growing business? You will need a business plan to give you a guide to getting started. And, how are you going to get your stash to the market? You may have no idea how to legalise your black-market operations. For success, it is vital to understand all sides of the weed industry. Between being a grower and supplier to patients, and marketing your products to customer service, there is a lot to know. You will have to take on many roles to build a successful business. Professional weed producers need to balance the growth and production side of the industry along with the sales. You need to be as good at marketing as you are at getting people to buy it for recreational use. One minute you could be talking to your operations manager about weed cultivation and the next be in a finance meeting to crunch the numbers. Running a professional weed operation is more complex than throwing some seeds into a pot and leaving it under a grow light tucked away in a cupboard. Getting rich means you need to do it right. You need to grow a lot for sale, which means you may have to deal with a lot of problems. Weed is an agricultural crop so there will always be ongoing pest management issues I you do not get them under control. High energy consumption and costs can be a challenge, especially if you are growing in an indoor facility. You need to create a production plan to avoid high monthly electricity costs of $30,000 or more for a small facility. Look at what different areas will cost – utility and labour costs, for example. You will also have to deal with the environmental conditions and other issues associated with growing weed. The demand is there for weed and weed products. It has always been there though on the black market. So, it becomes about supply and demand. On the black market the seller usually has the upper hand. In a legal market, legislation ups the ante on the old weed growers. Big corporations are investing in pot growing with big marketing budgets and access to advertising gurus. Don’t let the corporations make all the cash, get rich growing weed for you and your family. For the startup weed operators to set themselves apart, they need to focus on customer service. These days there is little difference between the majority of weed products so you need to stand out from your competition somehow. By focusing on customer service, you work on building a loyal customer following. You want your customers to come back. With billions of dollars involved in legal weed, you need to stand out from your competition. Create an individual brand based on your product philosophy. Become a trusted brand that has your customers returning over and over again. Marketing weed really comes down to brand. Marketing food is simpler as it really comes down to flavour and personal taste. There is little difference between the flavour of weed products, so it is about building a loyal brand following. So, if you are planning to turn to cannabis growing get rich, there is a lot of hard work and financial investment along the way. You will have success by providing customers with the best quality products and be willing to back your product and talk to customers who have questions or a problem with your product. The fastest way to get rich is to grow the best and only the best. The leaders in cannabis genome strains are Genetically Modified Weed.